Building your organization’s cybersecurity maturity doesn’t happen overnight. It takes time and thought to adequately assess all the factors that go into creating and implementing an effective security strategy, particularly what steps to take after you’ve made an initial investment in security. 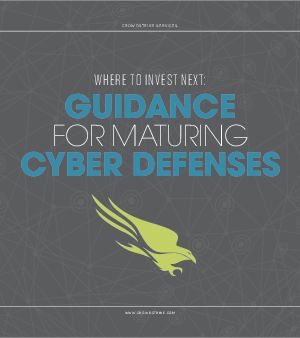 This white paper, “Where to Invest Next: Guidance for Maturing Your Cyber Defenses,” offers practical advice on achieving the level of cyber defense maturity that’s right for your organization. Learn why developing a security program that takes into account your risk level and the current state of your security posture is critical. You’ll also see why ensuring that everyone in the organization, from the leadership to the rank-and-file, is working toward the goal of cyber maturity is crucial to your success.